Gartner's latest forecast for worldwide smartphone operating system market share predicts that Google Android will be present on nearly half of all handsets sold next year, while the iPhone and its iOS operating system will account for 19 percent of units sold. Gartner on Thursday issued a prediction that worldwide smartphone sales will reach 468 million units in 2011, a 57.7 increase from 2011. By the end of 2011, Android will become the most popular operating system worldwide. And in 2012, Gartner sees Android accounting for nearly half —49 percent —of the smartphone market by 2012. For comparison, Gartner sees Apple's iOS taking 19.4 percent share in 2011, and slipping to 18.9 percent total global smartphone operating system share in 2012. And by 2015, Gartner predicts that Microsoft, with its Windows Phone platform powering Nokia handsets, will overtake Apple's iOS in smartphone operating system market share. The research firm has forecast Microsoft to represent 19.5 percent of the market in 2015, compared with Apple's 17.2 percent share with iOS. Still, Gartner has predicted that iOS will remain the second biggest platform worldwide through 2014. The research firm has assumed that Apple will be more interested in maintaining its profit margins than pursuing market share and dramatically changing its pricing strategy. 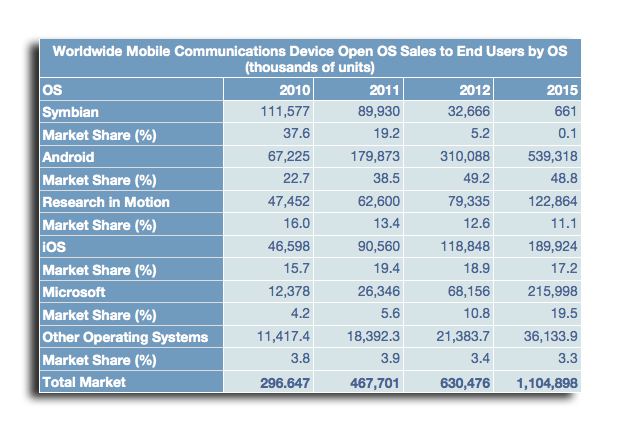 Its model sees iOS reaching its peak in terms of market share in 2011. Gartner sees Apple's approach limiting adoption in emerging markets, but there have been numerous rumors that Apple is interested in building a low-cost iPhone that could be sold without a contract or carrier subsidy. This year, Apple Chief Operating Officer Tim Cook also hinted that his company was planning "clever things" to compete in the prepaid handset market. "By 2015, 67 percent of all open OS devices will have an average selling price of $300 or below, proving that smartphones have been finally truly democratized," said Roberta Cozza, principal analyst at Gartner. "As vendors delivering Android-based devices continue to fight for market share, price will decrease to further benefit consumers. "Android's position at the high end of the market will remain strong, but its greatest volume opportunity in the longer term will be in the mid- to low-cost smartphones, above all in emerging markets."